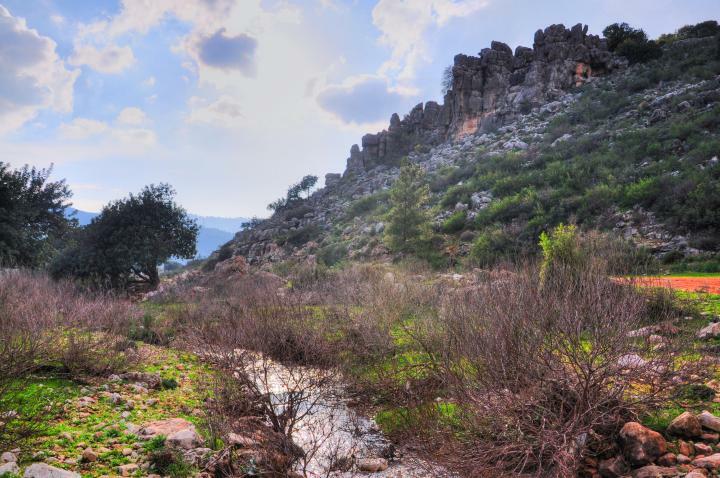 The Hilazon (Chilazon - snail) creek flows south of the Beit-Kerem valley, from the Sachnin valley to the plains of Acre. 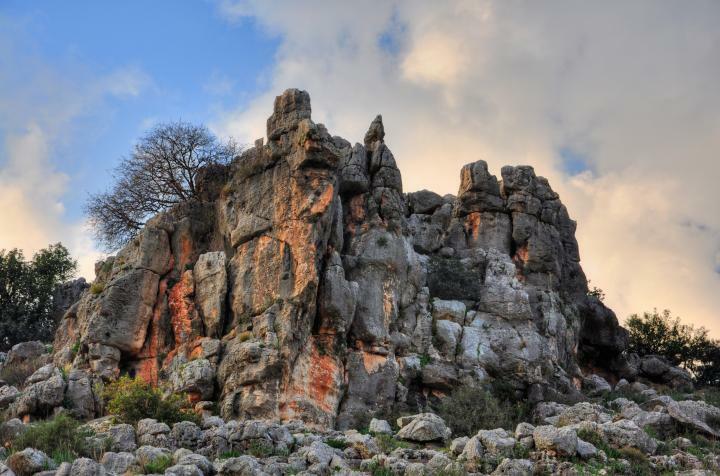 Along this nature reserve are a number of ancient sites, starting from the prehistoric periods. 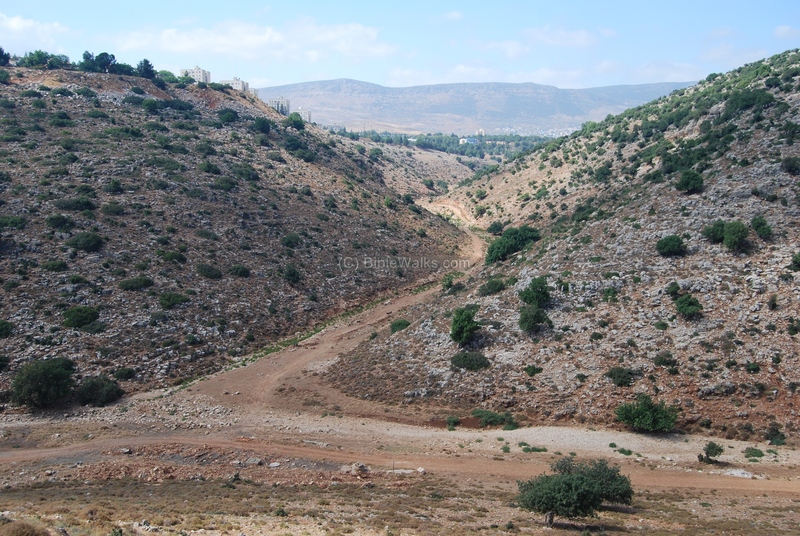 The Hilazon (Chilazon - "snail") creek flows south of the Beit-Kerem valley, from the Sachnin valley to the plains of Acre, merging into the Na'aman river. 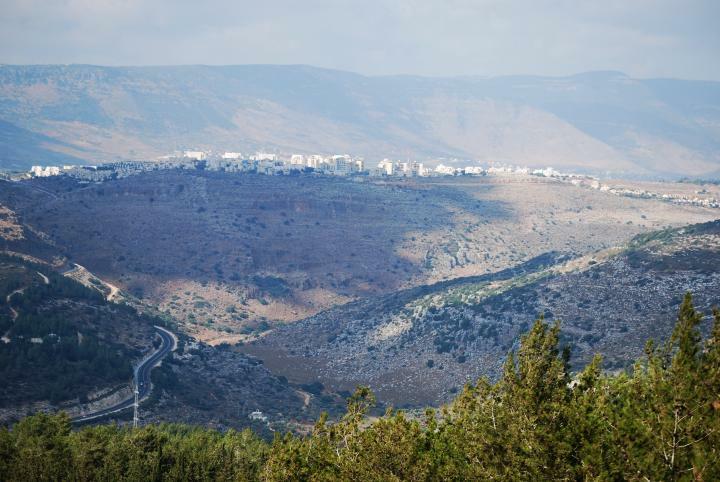 It is one of the four east-west valleys that comprise the Lower Galilee. The total length of the Hilazon stream is roughly 34KM, with a drainage area of 271 square KM, and is dry most of the year. 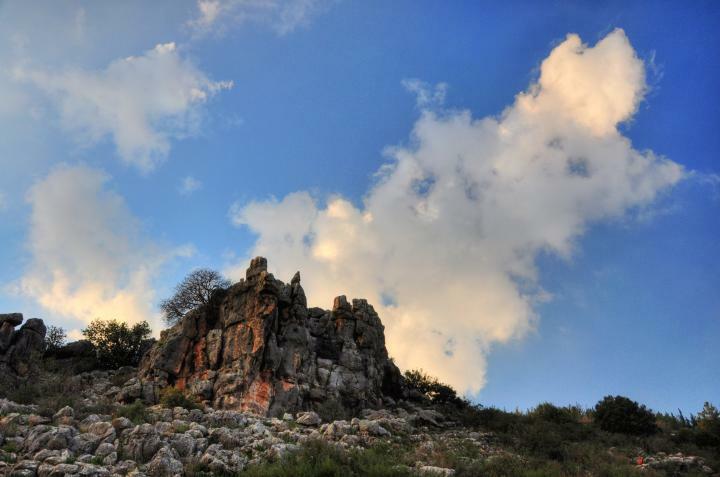 Along this nature reserve are a number of ancient sites, starting from the prehistoric periods. 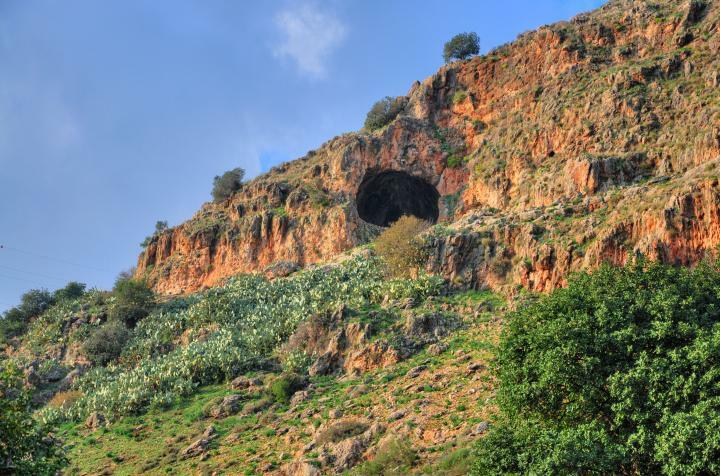 A number of Biblical sites are found in this region, where an ancient route linked the western Galilee with the eastern lands. It is a recommended hiking and mountain-biking trail. This is an overview web page - for a list of sites in this region check the Hilazon creek sites gallery. In 2008 archaeologists recovered remains from the Epi-Paleolithic period (16,000 - 8,300 BC) in a cave on the north side of creek. In this cave, called the "Lower Hilazon cave", the team unearthed a 12,000 year old skeleton of 28 early men, including a woman who was buried with animals and believed to be the grave of a shaman (a tribal witch doctor). The cave is therefore nicknamed "the witch's cave". These remains belong to the Natufian culture (12,000 to 10,000 years ago). The Hilazon (Chilazon- "snail") creek was an ancient route from Acre to the east, one of the branches of Via Maris (the Biblical "way of the sea"). This route bypassed the high mountains of Zefat from the south and used the east-west valley for a convenient low-slope travel. 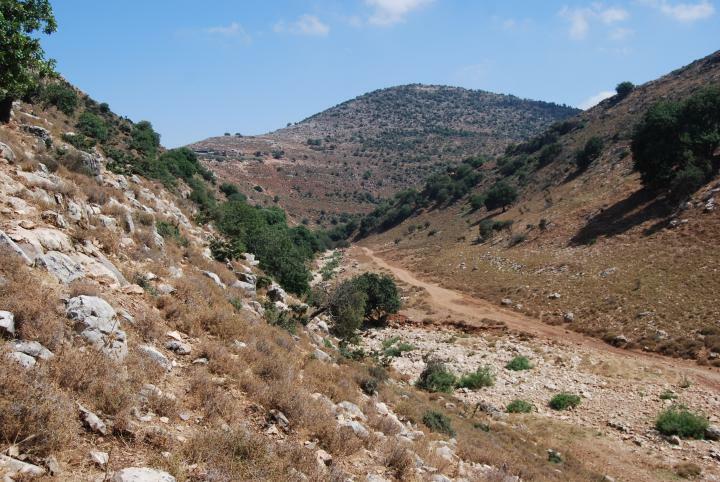 The road entered into Beit-Kerem valley through the Shezor creek at the point it joins the Hilazon near Khirbet Fachir, thus avoiding climbing up the steep mountain ridge around the valley. 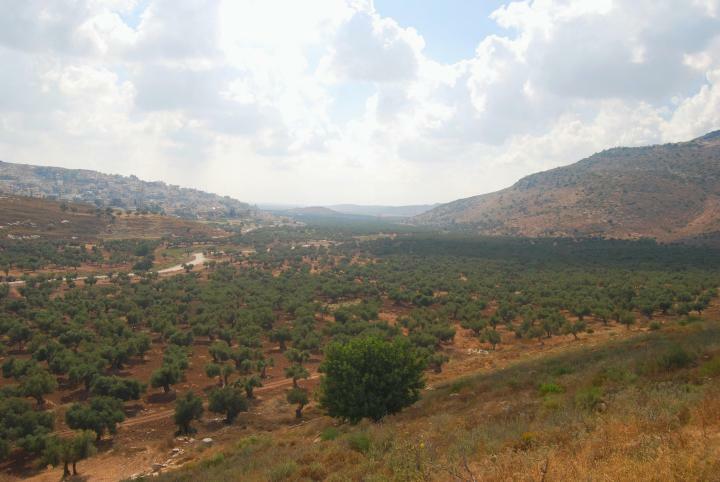 A number of sites were established along this route (including Ne'iel and Fachir inside the valley, and Rosh Zayit and others around the valley). In the wide valley of Sachnin, on the upper side of the Hilazon creek, was the city of Sachnin. Sachnin was mentioned as Sachan in the list of cities that were conquered in 1468BC by Egyptian Pharaoh Thutmose III. 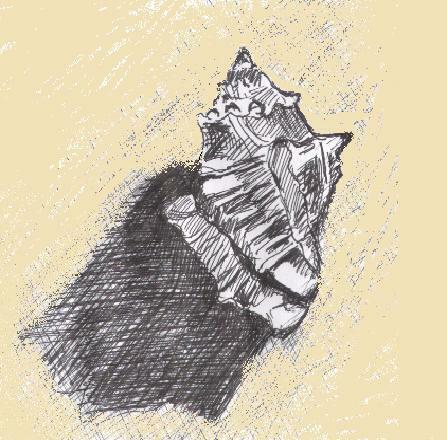 Their residents produced leather goods and used the purple dye extracted from the snail, which may have been the source of the name of the Hilazon creek. These sites were probably destroyed by the Assyrians in the 8th C BC (734-732), after the intrusion Tiglath-Pileser III (Kings II 15: 29). This intrusion wiped out most of the Galilean sites, as written in the Bible. 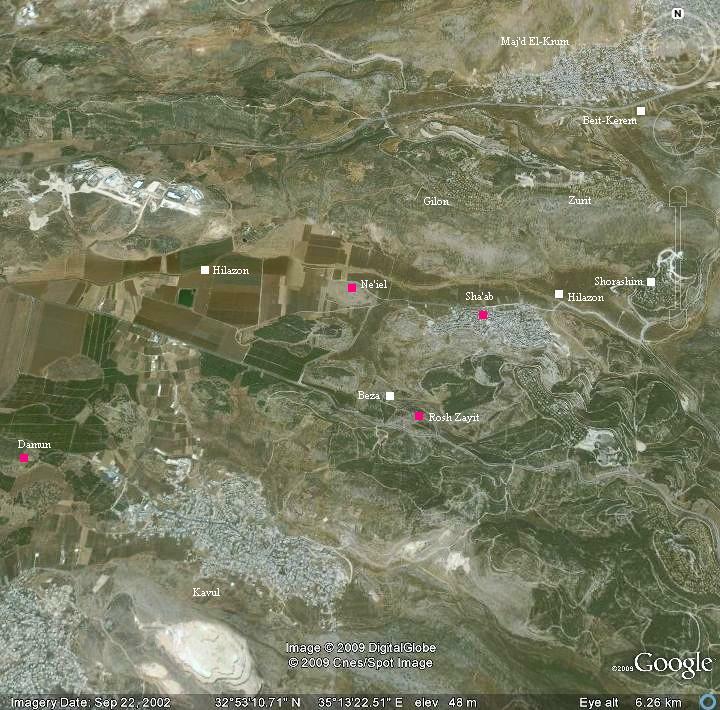 During the flourishing Roman/Byzantine period, dozen of sites were settled around the Hilazon valley. These included villages such as Sha'ab in the lower valley, and Sachnin (Suginin, Sagani, Siknin) and Arab (today's Arab'e) in the upper valley. The villages produced olive oil, wine and other agriculture products, and sold them to the growing population. After the Persian/Arab conquest in the 7th C the Galilee suffered from a total decline, and most of the sites were destroyed. During the Crusaders period (12-13th C) the eastern flank of their capital, Acre, was protected by their important fort in Zefat (Tzfat, Safed). The roads through Beit-Kerem and Hilazon supported this link. After their retreat, the area returned to be deserted until the late Ottoman period. A number of small structures were built in the late Ottoman period (19th C) along the Hilazon creek, including Fachir. In 1930 a modern road from Acre to Zefat through Beit-Kerem was constructed by the British on the hills north of Hilazon, and the ancient road ceased to be useful for cross country travel. The modern Hebrew name "Hilazon" was translated from its Arabic name - wadi Halzun - meaning "snail creek". The upper (eastern) section of the Hilazon creek, near the Arab villages, is heavily polluted by sewerage overflow, garbage disposal and other activities. A petition to save the creek was formed in 2007 and managed to clean up the creek. The lower (western) section is kept clean and well preserved, and is part of a mountain bike route ("P2K trail"), a 35km route that combines an urban and nature reserve. This medium-sized marine snail (Hilazon in Hebrew, Murex trunculus as scientific name) was one of the important sources of dye colors in antiquity. 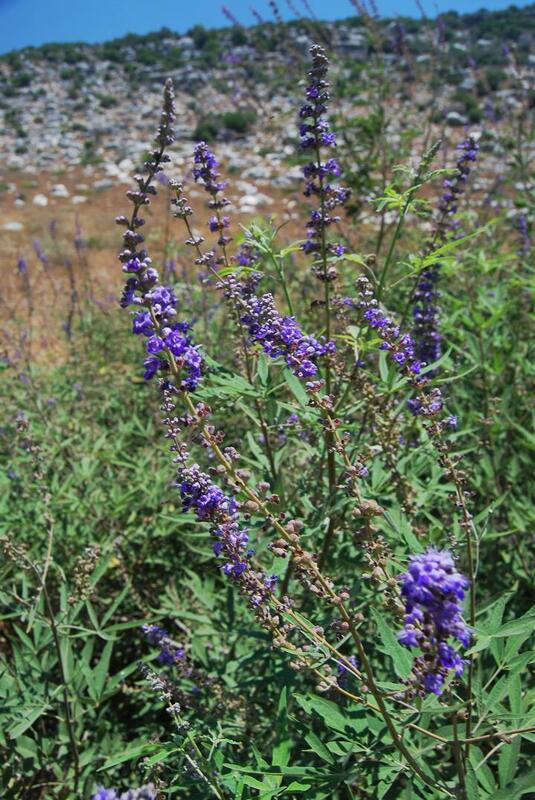 The Canaanites, Hebrews of the Zebulun tribe, and especially the Phoenicians produced the deep-purple indigo dye which was used for the textile industry. Purple became a symbol of status, sovereignty and power. The Old testament specifies a blue dye (Tekhelet) for use in the Priestly garments as well in the layman's tzizit (a fringe in the upper garment). For example (Exodus 28:6): "And they shall make the ephod of gold, of blue, and of purple, of scarlet, and fine twined linen, with cunning work". Since 60,000 murex were needed to produce one pound of dye, the dye was highly prized in ancient times. 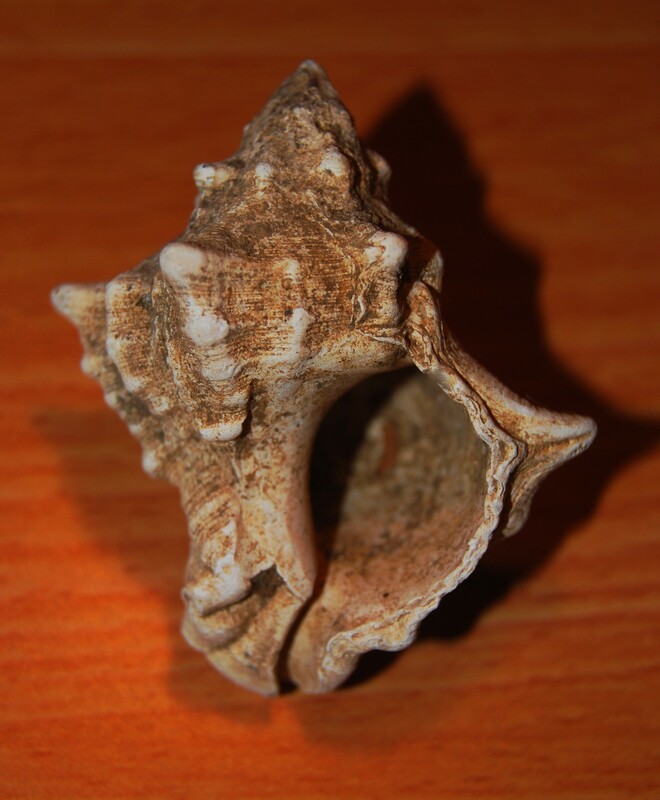 Their shells are found in most of the Phoenician sites along the coast in Israel and Lebanon. The plains of Acre were one of the centers of production, and so the Hilazon creek - which flows there - was probably named after this industry. According to Greek legend, the purple dye was discovered by chance: the patron gods of Tyre, Melqart and Tyros, were walking along the shore with their dog. The dog bit a snail, and came to his master with his mouth stained with color. Melqart collected more shells and prepared a purple robe for Tyros. Later, the Phoenicians of Tyre and around the Mediterranean coast skilled in purple dyeing. The Greek name of "Phoenician" means red-purple, based on their production and trade of the purple cloths. The dye production slowed down during the Roman/Byzantine periods, since it was restricted to the nobility and limited by law to the official production centers. The Arabs completely stopped the dye production in the 8th C and the secrets of the process was lost for ever. 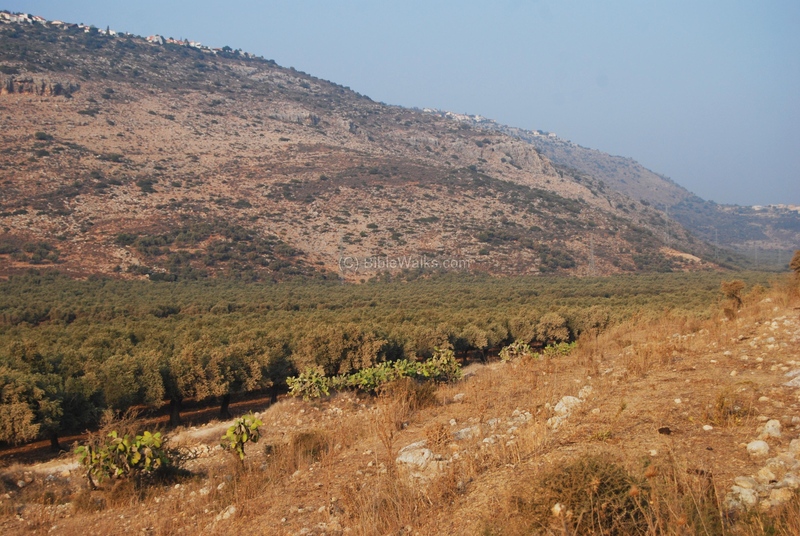 The photos below are arranged in the order from west (closer to the sea) to east (to the heart of the Galilee), and presented in 3 sections. An aerial map of the western section is seen below. 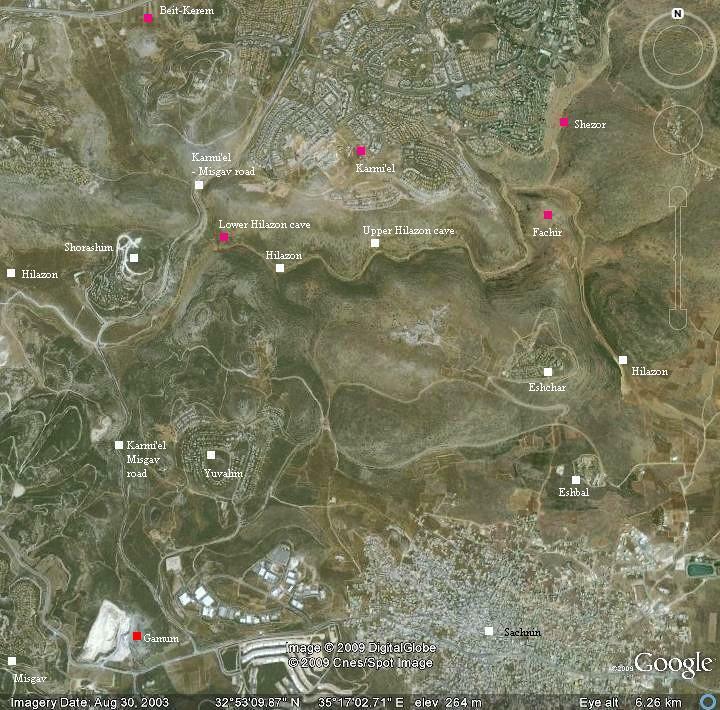 It spans from the valley of Cabul to the Karmi'el road (near Shorashim). You can point on the purple points to navigate to the selected site. 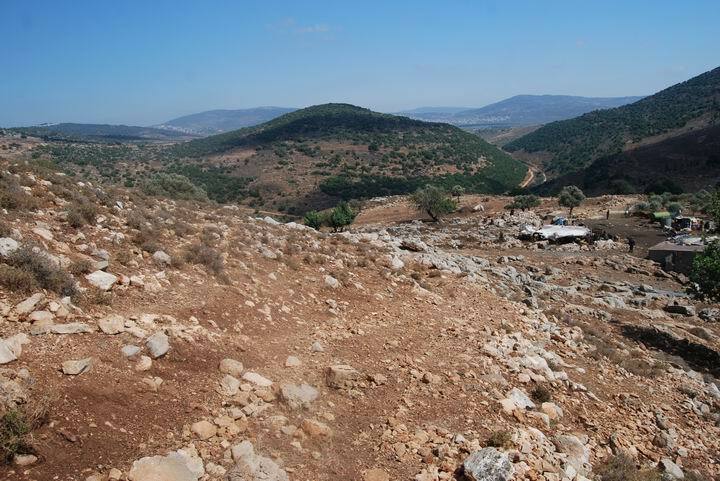 A view of the western edge of the Hilazon creek is seen below, taken from Khirbet Beza, a Roman period site. The Ya'anin hill is located on the western side of the creek, and is identified as the Biblical site of Ne'iel, one of Asher tribe cities. The view from the foothills of Ne'iel presents spectacular views of the valley and the thousands of ancient olive groves that grow along the Hilazon creek. Near Ne'iel is the Arab village of Sha'ab, seen on the left background in the photo below. This is an Arab village 2KM to the east of Ya'nin/Ne'iel. The name means in Arabic: gorge. It is located on the ruins of a Roman/Byzantine Jewish village by the name of Sha'av (which means to pump water), and it preserved the ancient name. Further east, the gorge gets deeper and narrower. 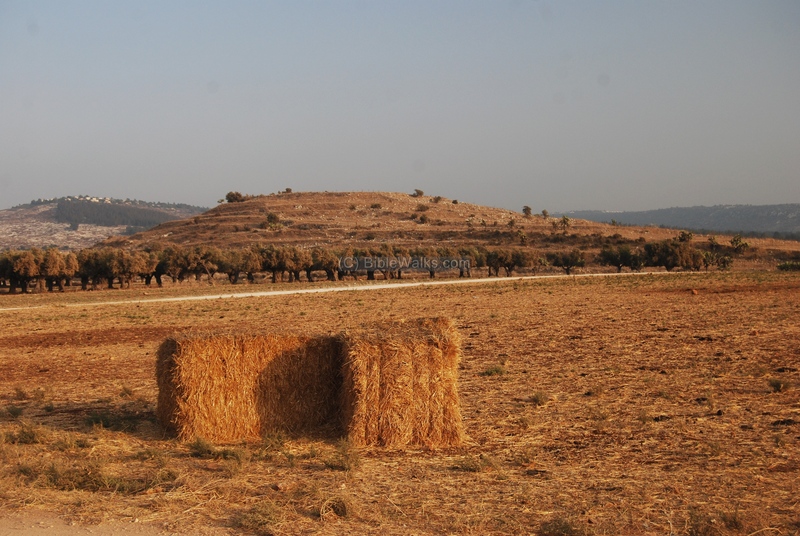 The photo below is a view from the modern settlement of Shorashim, looking towards the east. 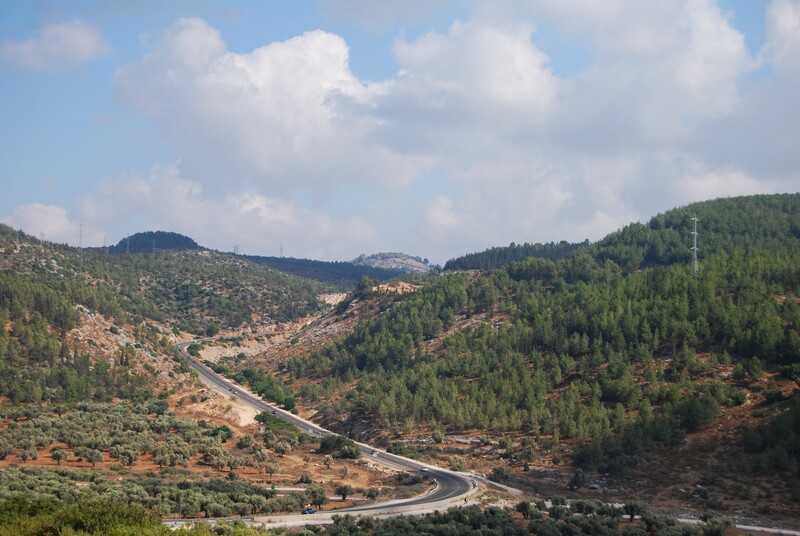 At this point is a road that connects the city of Karmi'el, in the center of Beit-Kerem valley, to Misgav south of Hilazon. The road climbs up the steep gorge towards Misgav, as seen below in a view towards the south. 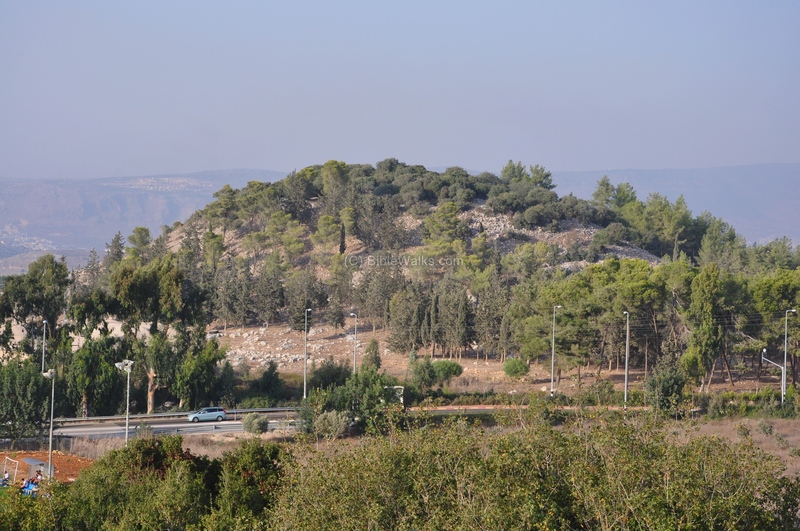 The round hill in the center background is the site of Khirbet Gamum (El Jumeijma), a walled Biblical city that existed until the Hellenistic period. According to a notable scholar (Aharoni), Gamum may have been the Biblical city of Hukuk (Huquq), although that place is normally identified near the modern Kibbutz of Hukuk. A view of its south side is seen below. The ruins are located on the top side of the hill. An aerial map of the middle section, from the Karmi'el road to the edge of the valley of Sachnin, is seen below. 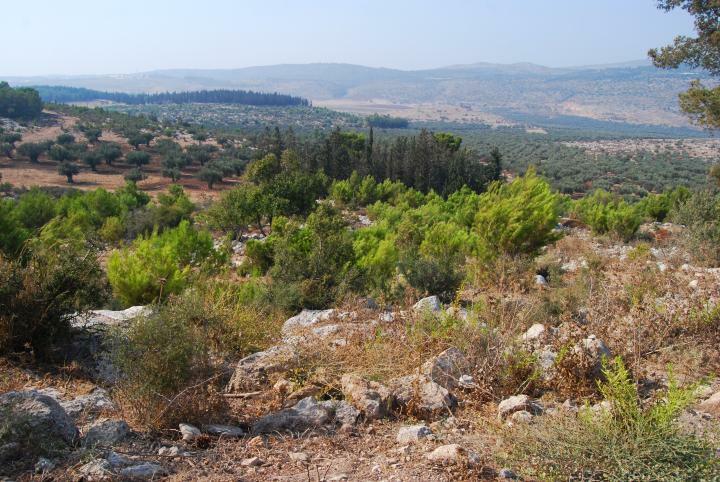 Starting from the point where the modern road to Karmi'el cross the valley, there is a turn to a dirt road that leads to the east. 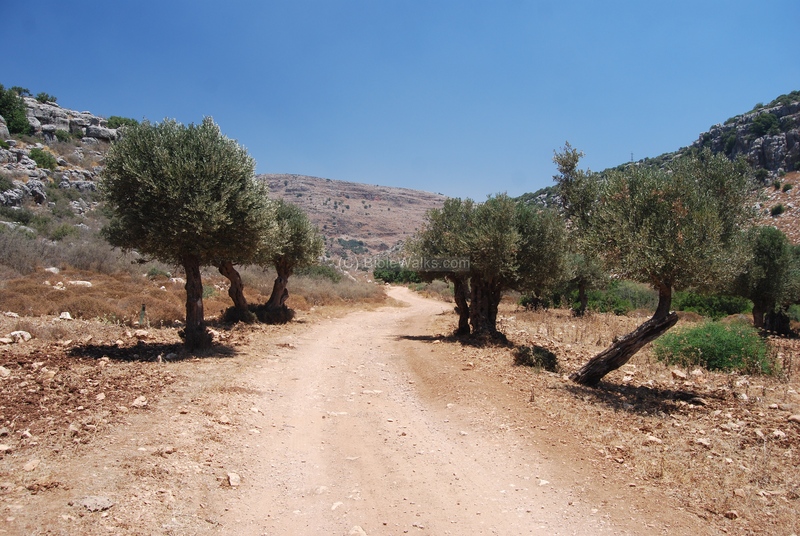 A section of the road is seen below, with olive trees flanking the road on both sides. Interesting rock formations are seen on the cliffs above the road. During the winter, after several days of rain, there is a stream of water. Along the path of the Hilazon valley are remains of an ancient road that once carried the caravans from Acre to the east. A section of a ancient road is seen below, with the modern road just above it on the left. The photo below shows another view at this section, with the southern cliffs hanging above. The modern settlement of Yuvalim is seen in the top of the hill. After several hundred meters, the creek makes a sharp turn to the east. High above the valley is a small prehistoric cave, "lower Hilazon", where remains of 12,000 year civilization were found in recent excavations. Most notable of these excavations is the grave of a shaman (a tribal witch doctor), a Netufian woman who was buried with animals. The cave is therefore nicknamed "the witch's cave". Further to the east, the gorge gets deeper and narrower. The gorge then makes a full loop around the steep hill (from right to left and behind the hill). 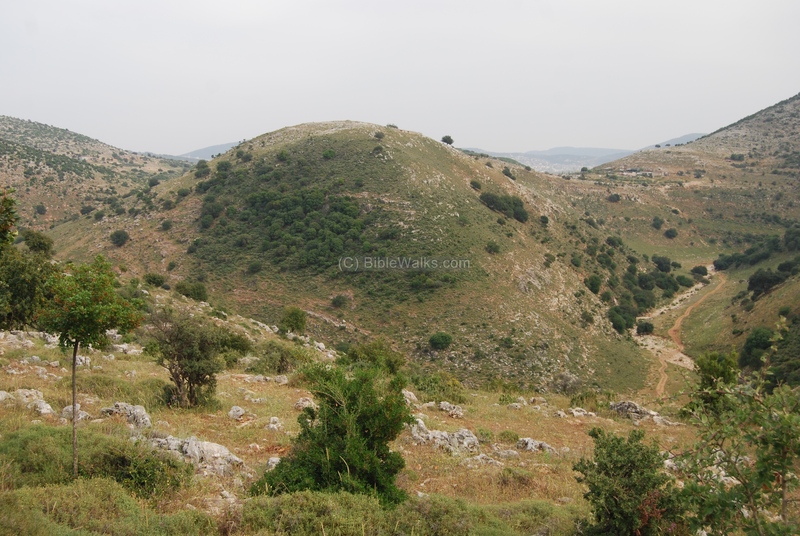 Here is another Biblical site - Khirbet Fachir, another gem in the path of the creek. 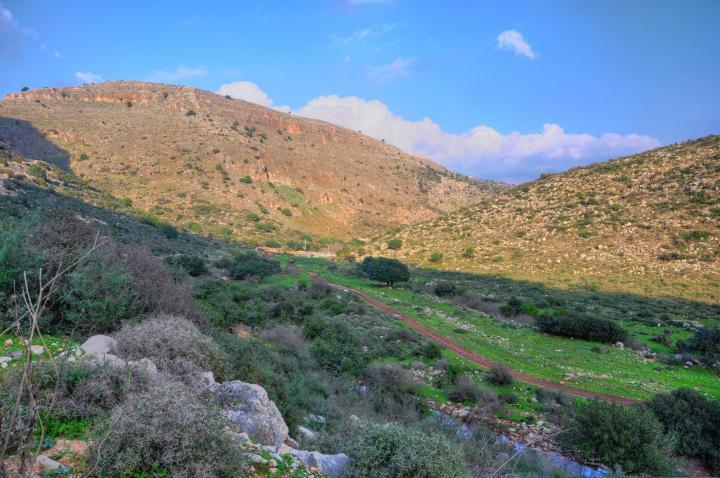 On the northern side of Khirbet Fachir, the Hilazon creek meets the Shezor creek, which flows from Beit-Kerem on the north. 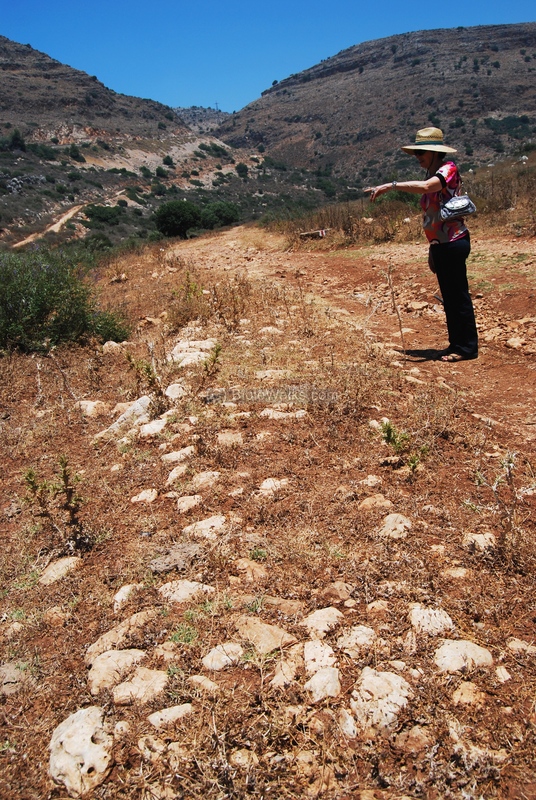 This path along Shezor creek was probably one of the ancient trade routes from the plains of Acre, along Hilazon creek, into Beit-Kerem valley and eastwards. 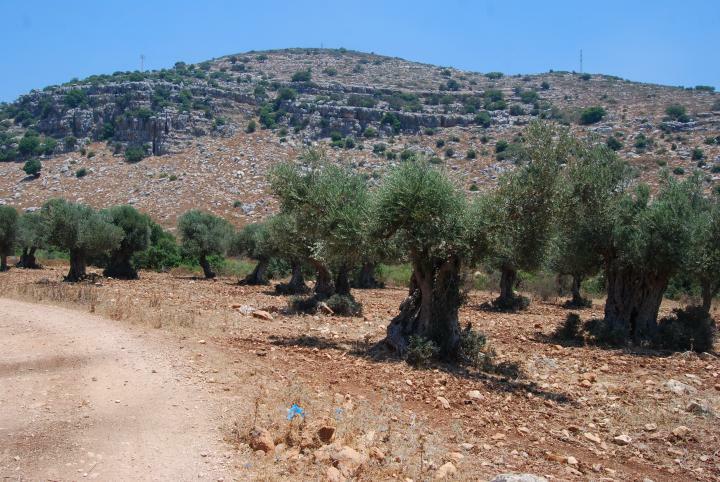 Alternative routes were more difficult due to the high mountains that surround Beit-Kerem. A view from Fachir to the south-east shows that the creek continues to loop around the hill. The creek continues to the east, passing by the Arab villages of Sachnin, Arab'e and Deir Hanna. A panoramic view of the Sachnin valley is seen in the photo below, as seen from Mt Kamon. The hill on the left side is Mt Hilazon, which reaches a peak of 352M (the valley is roughly 170M at the foothills). In the far background are the villages Arab villages of Deir Hanna (left), Arab'e (center) and Sachnin (right). Another view of the Hilazon hill is seen below. A settlement, Lotem ("cistus flower"), is located on the hill. Founded as a Kibbutz in 1978, it became a communal village in 1996. More photos will be added later. Along the creek are a variety of plants. This purple-flower bush is found along the Hilazon and in most of the creeks of Israel. It is called "Lilac Chaste Tree", where Chaste means "modesty" or "humble". Another common name was "Monk's Pepper", since according to medieval belief its berries deprived desires, and were added to the bread in the monasteries, helping their monks to maintain their vows of chastity. It is also used for other medical purposes and as a yellow color dye. "Siach Avraham Matsui", meaning: Abraham's common bush. These names are based on the tradition that Isaac was saved by the (humble) lamb (or ram) who was caught in this thicket (bush), when Abraham was about to sacrifice his son. As per the Bible (Genesis 22, 13): "And Abraham lifted up his eyes, and looked, and behold behind him a ram caught in a thicket by his horns: and Abraham went and took the ram, and offered him up for a burnt offering in the stead of his son". Rosh Zayit - Phoenician site on the south-west side of the creek. This text refers to the ritual of the tzizit (fringe), which should by dyed by a blue (Tkhelet) color. "And the LORD spake unto Moses, saying, Speak unto the children of Israel, and bid them that they make them fringes in the borders of their garments throughout their generations, and that they put upon the fringe of the borders a ribband of blue: And it shall be unto you for a fringe, that ye may look upon it, and remember all the commandments of the LORD, and do them; and that ye seek not after your own heart and your own eyes, after which ye use to go a whoring:"
Hilazon creek - The modern Hebrew name "Nahal Hilazon" was translated from its Arabic name - wadi Halzun - meaning "snail creek". Nahal - Hebrew: stream, brook, creek. Argaman - Hebrew for "purple", the color of the dye extracted from the Hilazon. According to the Hebrew Kabalah, the Hebrew name is the initials of five angels (A-Urial, R-Rafael, G-Gabriel, M-Michael and N-Nuriel).